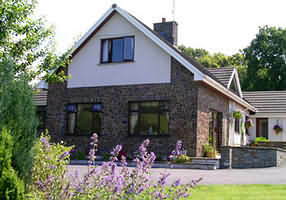 Llandovery accommodation in friendly Llandovery hotels, B&B, Bed and Breakfast, homely Guest Houses, cosy Holiday Cottages, congenial Country Pubs and Inns, luxurious Llandovery Country House Hotels and Caravan and Camping sites. 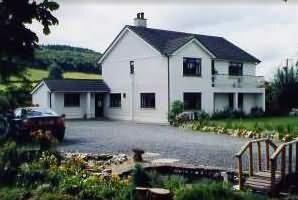 Situated near Brecon Beacons National Park, our location is ideal for walking, hiking and fishing. The property dates back to the 1790s with many original features still remaining including traditional wood burning fireplace and exposed beams. A family-run business, the hotel was taken over by Karen and Ashley in 2004 and completely refurbished in a sympathetic manner. All of our double bedrooms have TVs with 33 digital channels, en-suite facilities with wc, sink and shower. Also tea/coffee making facilities. Or from £35 per person per night for single occupancy. These prices include Full Cooked Breakfast. Packed lunches are available by prior arrangement for those wishing to picnic or those who Rally. 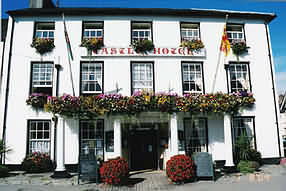 The Castle Hotel has for many centuries been at the heart of this thriving community on the western edge of The Brecon Beacons National Park in the county of Carmarthenshire known as ‘The Garden of Wales’. This is an area renowned for its rolling hills and spectacular landscapes, deep rooted heritage and culture. Here at The Castle you will find traditional old charm and comfort, soft leather, undulating ceilings, creaking floors, oak beams, open fires and quirky plumbing that is always hot on delivery! The Castle provides some 20 bedrooms, of differing design all with en suite facilities. New owners Carol Lincoln and Nick Evans are embarking on a refurbishment programme in late 2007. The Nelson Room and Lady Hamilton Suite are named after those famous inhabitants who stayed at The Castle on Nelsons last tour of Wales before his triumph and demise at the battle of Trafalgar. All prices are per room per night and include FREE INTERNET ACCESS full breakfast and VAT. Mr & Mrs Blud look forward to welcoming you to the historic Drovers Guest House, an exquisitely furnished 17th century town house situated at the heart of the market town of Llandovery. Their excellent facilities and ideal location make them the perfect base from which to take in the beauty of the rural surroundings or to enjoy some of the exceptional events in the area; including the RAC Rally and Drovers’ Festival. 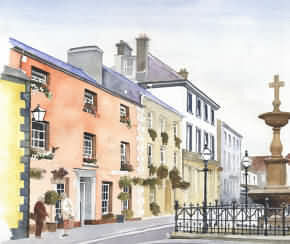 Here in Llandovery you will discover tremendous scenery and warm, welcoming people. The Drovers offers two double and one twin room, all en-suite, beautifully furnished, prettily decorated and entirely in keeping with the style of the building. 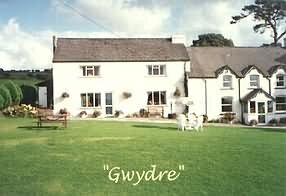 We take great pride and pleasure in welcoming back, time after time, guests who fall in love with our guest house and the atmospheric town of Llandovery. The surprise is the price, at just £25 per person, per night for double occupancy and £35 for single occupancy. The experience however is definitely beyond that in value. 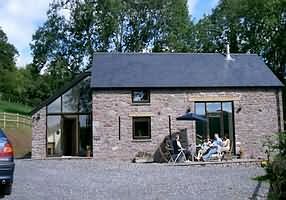 "The Warmest of Welcomes Awaits you at Llanerchindda Farm"
Llanerchindda Farm is set in 50 acres of Welsh Countryside with spectacular views over looking the Bran Valley and the Brecon Beacons. It is the perfect base from which to enjoy the remote empty heartland of Wales. 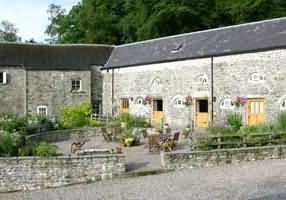 At Llanerchindda we offer Dinner, Bed & Breakfast, Self-Catering Cottages and a base for Outdoor Activities. By using a combination of our serviced and self catering accommodation we can cater for individuals or groups of up to 35 people. 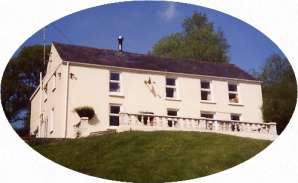 Bounded by a small stream the house offers a comfortable base for those that wish to explore around the Brecon Beacons National Park and the surrounding areas. Lounge with 32" wide screen sky TV. 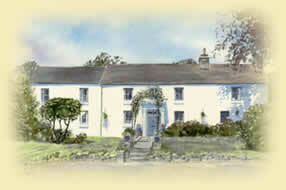 2 double en-suite rooms and 2 twin en-suite rooms. All rooms have tea / coffee facilities and hairdryers. Good full cooked breakfast with range of cereals etc. Iron and board, washing machine and dryer available. A B-B-Q is available here on the patio. Plenty of parking. Garage available for motor bikes, bikes etc. Horses / Ponies please phone for details / prices. For Epynt enduro's, Network Q rallies please book a.s.a.p..
Prices £24 per person per night, £30 for single occupancy with discounts for longer stays. 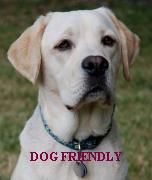 Dogs and Cats are welcome provided they are well behaved. Please bring there bed / favorite food etc. Horses are welcome by arrangement. Two full size stables and paddock available, simply superb rides out from the house. Cwrt Deri - 'Oak Court' is an 18 acre smallholding, deep in the heart of the beautiful, peaceful, countryside of the Upper Cothi Valley. The house is set in a lawned garden which has several water features. Guest's are invited to share a welcoming cup of tea and welshcakes on their arrival. Iris and Tegwyn offer free transport for any guest wishing to spend an evening at one of the local pubs. Good food available locally. Cwrt Deri is 500 yards off the main A482 Llanwrda to Lampeter road being on 7 miles off the A 40.
to their working dairy farm since 1974. A very comfortable 17th Century farmhouse, with an original inglenook fireplace, beamed ceilings and stone walls. 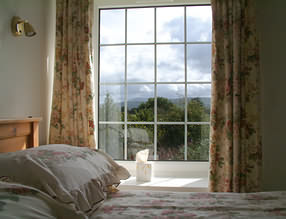 Both bedrooms have panoramic views of the Black Mountains. Excellent farmhouse cooking, using home produced Welsh lamb, home grown vegetables and all local produce. Ideally situated for the National Botanic Gardens of Wales, Brecon Beacons, Carreg Cennen Castle and other local historic sites. A perfect location for cycling, walking, fishing and bird watching. Hair dryer, individual room heating, tea and coffee making and a TV in each room. We are sorry, but we cannot accommodate pets due to the proximity to the working part of the farm. No Smoking in the rooms or dining area. 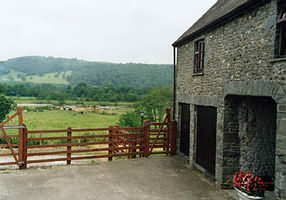 Cwmgwyn Farm is a working farm rearing cattle and sheep. It is admirably situated with splendid views across the river Towy which runs through the 210 acre livestock farm. Guests bedrooms are tastefully decorated and furnished to exceptional standards. 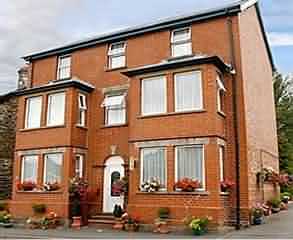 All three bedrooms have a colour TV, tea and coffee making facilities and a hair dryer. For guests privacy, spacious en suite bathrooms are in all bedrooms. Double or twin bedded rooms are available. Henllys Estate is an historically listed site, dating back to the late 16th century. One of the Estate buildings, within a stone walled courtyard, has been tastefully converted into bed and breakfast accommodation. Each room is en-suite with digital television, tea and coffee making facilities with access to the garden and views across the Towy valley. The estate is still a working farm and provides some of the ingredients for breakfast, the rest being sourced as locally as possible. Guests can enjoy walks in the 12 acres of broadleaved woodland and fishing in the trout lake. and less than 1 hour from the coast. Rates are based on twin occupancy. Ideal for those seeking a short break in the countryside with peace and tranquillity, away from the madding crowd. Formerly an 18th Century farm house, Beiliglas is situated in a secluded corner of the Brecon Beacons National Park, surrounded by quiet country lanes and footpaths but only 3 miles from Llandovery and the A40. We offer bed and breakfast accommodation in a spacious double room with ensuite bathroom or alternatively in a more basic twin bedroom. Breakfast is relaxed and can be traditional or vegetarian. A TV is available, as are tea and coffee making facilities. Guests can spend time relaxing in the garden, which is planted with aromatic plants loved by bees, and listen to the birdsong. Packed lunches can be provided upon request and a home cooked evening meal with fresh vegetables from the garden may also be ordered in advance. 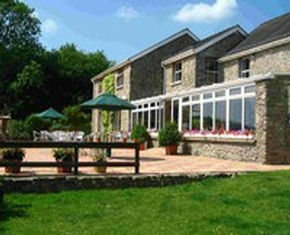 Situated between Llandovery and Lampeter in Carmarthenshire. This is an area of outstanding natural beauty with rolling hillsides, miles of forest walks, dramatic mountain scenery and cascading rivers. The house is in a tranquil setting off the main roads overlooking beautiful countryside. It is surrounded with large grounds which the guests are welcome to enjoy. All the bedrooms are spacious offering comfortable accommodation and have en-suite facilities as well as individually controlled central heating, complimentary tea and coffee making trays and colour TV. We offer a full cooked breakfast in our comfortable dining room or something lighter if you prefer. Packed lunches are available on request if you want to venture out and take advantage of the beautiful countryside surrounding us. Janet and Eirwyn will do their best to ensure that your stay is a happy and memorable one. With stunning panoramic views of The Brecon Beacons and the Carmarthenshire Fans, our Grade II listed farmhouse consisting of the main house and attached cottage dates back to the latter part of the 18th century. Myrtle Hill Guest House has been refurbished to provide a range of facilities to maximise your comfort and enjoyment during your stay. 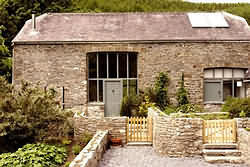 The Cottage, which will sleep 4 to 6 people, is situated within a few yards of the main farm house. A sympathetic restoration of an old stone barn The Cottage retains many original features such as exposed beams and stone walls. Furnished and decorated to a high standard, you can be sure of a comfortable stay. The Cottage has its own drive in garage; secluded lawned garden which is private from the farm with picnic bench, barbecue and washing line. Easy access to ground floor bathroom, with bath and shower facility. With its own parking access and fully self contained, The Bungalow offers even more privacy. We are sorry, but we cannot accommodate pets due to the proximity to the working part of the farm. No Smoking within the accommodation. on a working livestock farm, with truly superb views overlooking the River Towy and down the winding valley. Swans, Herons and the Red Kite are frequent visitors to this stretch of river. There are lovely peaceful walks down to the river, situated on the western edge of the Brecon Beacons National Park, an ideal base for walking, bird watching and fishing. It has been recently restored to a very high standard, retaining all the original oak beams complimented by Welsh oak floors and the original stone walk. A superbly equipped kitchen with built in electric cooker, hob, microwave, dishwasher and fridge. Sitting area with comfortable leather sofa and chairs, colour T.V. with video; and an electric log effect cast iron style black stove. Downstairs utility area with washing machine/tumble drier and deep-freeze for successful anglers. Full oil central heating and electricity is inclusive. Bed linen and towels provided. Sorry no pets. 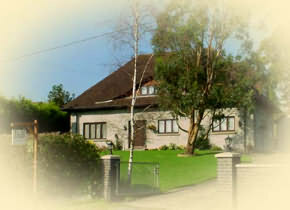 We also do bed and breakfast in the farmhouse if anyone wishes to join guests for a few days. with accommodation of the highest quality. It is well equipped, luxurious and the views are spectacular. There are three double bedrooms to sleep six plus a cot for your young one. In the entrance hall you will find books and leaflets on places of interest to visit. A laundry room is adjoining with washing machine and dryer. The hallway provides access to the two bedrooms, bathroom, the kitchen and lounge and then up to the gallery and third bedroom. Linen is provided in all bedrooms with additional linen available. All have adequate storage. All have bedside lamps and clock radios. There are two patio areas provided with tables and chairs for relaxing with a glass of wine or to have a barbecue. The cottage has no steps on the lower floor or outside and is wheelchair friendly. There is ample parking with security lighting. The wooden shed at the rear will enable you to store your own bicycles and you will find the barbecue here. Ideal for romantic breaks. 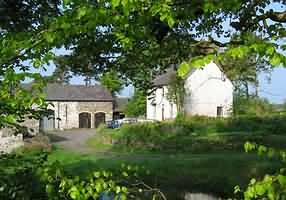 Choose Nantifan Barn for your luxury holiday cottage when visiting Wales and experience the Welsh countryside in and around Carmarthenshire for yourselves. Gwydre Cottage is ideal for a family and depending on the season the children can feed the lambs, watch the cows and calves or simply play on the fields nearby. Gwydre Cottage provides every modern amenity and comfort, yet retains it’s original charm and character. The accommodation is very spacious, and the living room is rich in character with its original inglenook fireplace, and an inviting wood burner-logs are provided. There is also a ½ size snooker table, electric organ, TV and video in this charming room. The fully fitted kitchen is very well equipped with dishwasher, cooker, washing machine, microwave, slow cooker, freezer, fridge, highchair and more. 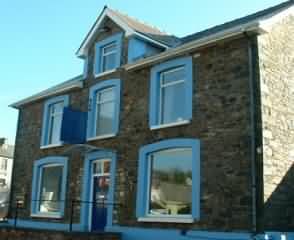 This homely accommodation has 3 tastefully decorated bedrooms consisting of 2 double beds, 2 single beds, and 1 cot. Also a bathroom with shower and separate toilet. All linen and towels are provided. Adjoining the cottage is a superb lawned area for children to play, garden furniture and ample parking. Ideal for those seeking peace and tranquillity with views across the fields to the Mynydd Myddfai. Field View Cottage is situated about one mile from the village of Myddfai itself and only 3 miles from Llandovery and the A40. The cottage is in a secluded situation in an unspoiled corner of the Brecon Beacons National Park, surrounded by quiet country lanes and footpaths which offer a wealth of wild flowers. The village is just a short walk across the fields. Field View Cottage, once a traditional stone stable, has been sympathetically converted to provide self catering accommodation. Whilst still retaining much of the original character it now benefits from the comfort of under-floor heating and comprises a spacious living room/kitchen, two bedrooms and a bathroom. It is ideal for the less mobile being all on one level. The living room has an attractive wooden ceiling and original exposed beams. A large wood burning stove with a supply of logs is provided for those who enjoy the delights of a real fire on cooler evenings. The kitchen area has modern fitted units, gas cooker, microwave, refrigerator and freezer. The bathroom has a bath, shower, handbasin and toilet. One bedroom has twin beds and the other a double bed. A cot is available if required. Duvets and bed linen etc. are provided but towels are only supplied to overseas visitors by request. The cottage has been designed with the needs of those following outdoor pursuits in mind. The hallway is floored with quarry tiles making it ideal for those muddy boots and there is ample hanging space for dripping waterproofs! There is a private garden area with sturdy picnic table behind the cottage. Non smokers preferred and we do not normally accommodate dogs. It is secluded, but not isolated. 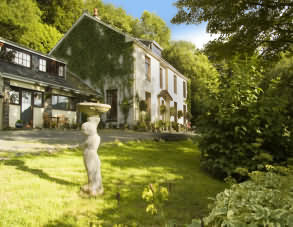 Cilycwm, with its excellent pub is an easy walk away. Because we are in one of the least densely populated parts of Wales, the quiet, the lack of traffic, the absence of sounds other than the birds, the breeze in the trees and the burbling of the Nant Croiddur stream contribute to Cwmcroiddur’s unique capacity to ease away the stresses of everyday life. 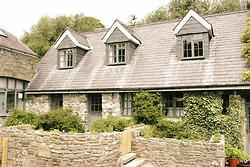 Barcud Cottage is the original Cwmcroiddur farmhouse. Four hundred years ago, people and their animals would have shared this Welsh Longhouse through the winter months, kept warm by a fire in the centre of the room. Now it’s a welcoming retreat all year round. 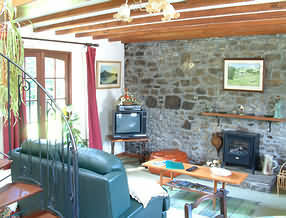 Croiddur Barn is spacious and spectacular place to stay. Previous visitors have commented that staying in the barn ‘makes you feel rich’! Built in a style that’s particular to this area, the barn has ‘folded corners’, a huge window overlooking the pond and two fine arched doorways. Once they allowed the passage of hay wagons, now the windows infuse the building with light and bring the magnificent countryside indoors. Dating from the early part of the 17th century, with additions in the 18th and 19th centuries, Cwmcroiddur is one of many historic properties in the area. It started life as a hill farm, and is now a small estate nestling below the Mallaen Mountain just a kilometre away from the picturesque village of Cilycwm. Rhydins Farm are located within easy reach of all the attractions that this county has to offer including the National Botanic Garden, Aberglasney Gardens and the many castles and historical monuments that abound in this part of the world. We are also within easy reach of the temple at Skanda Vale for those people making a pilgrimage there. 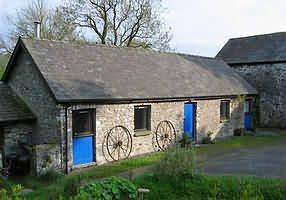 We offer a high standard of self catering accommodation in a range of attractive converted farm buildings. 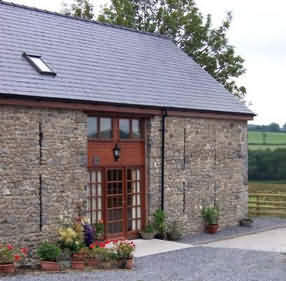 We offer three delightful cottages set in the rolling countryside of north Carmarthenshire. 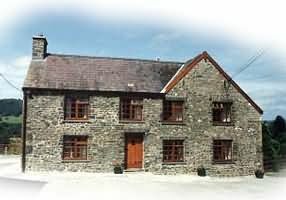 Our other cottages, each sleeping 4 in comfort in double and twin bedrooms, are situated opposite Rhydins Fawr making it suitable for very large family gatherings or groups of friends to be close to each other. 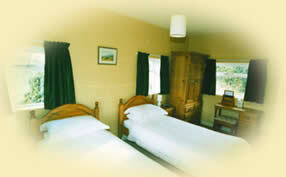 Each cottage has two bedrooms with a double bed in one and two single beds in the other. On the ground floor is a fully equipped kitchen and a living/dining area with TV/video and a log fire (logs provided free of charge), two armchairs and a sofa. In the kitchen area is a dining table with four chairs. To the rear of the cottage is a bathroom and shower with a separate toilet. For your comfort each cottage has central heating and log fires (the cost of which is included in the price in the cottage). The hot water is also supplemented by an electric shower making it a pleasure to relax after a long day out. • Full Central Heating • Ironing facilities • Hairdryer • Linen, heating and electricity included in price • Local Maps and Tourist Information. 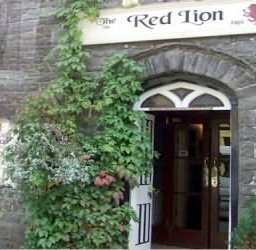 Being one of the UK's 4% of grade two (star) listed buildings, the privately owned Red Lion in Llangadog is one of the many coaching inns throughout the beautiful Towy Valley in Carmarthenshire. A place full of character & life, with a passion for fresh, locally produced food & excellent service, making the Red Lion a popular venue with locals & tourists alike. We have wonderful rooms in the inn, with Single, Double and Family rooms available. 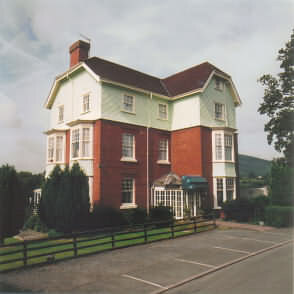 Bedrooms are all comfortable and a full Welsh Breakfast is included. Children are welcome and all rooms are non-smoking. ROOM TARIFF Family en-suite (sleeps up to 4 ): 75.00 Single Room en-suite: 38.00 Double Room en-suite (sleeps 2): 65.00 All prices include a full cooked breakfast. Situated in one of the most remote unspoilt areas of outstanding natural beauty the park is an ideal centre for hill walking and exploring the rugged landscape of the Brecon Beacons National Park and yet is still conveniently located for countless other attractions. 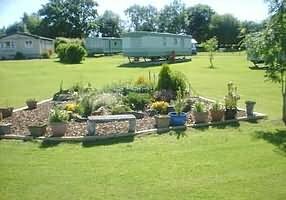 Our site has a small number of static caravans which are available for hire, as well as facilities for tents and tourers. There are also a few pre-owned static caravans for sale and pitches may be made available for new static caravans. There is ample room for uncrowded camping over a total of 6.5 acres. Our laundry is equipped with washing machine, tumble drier and iron. Washing up facilities are also provided as is a waste water and chemical toilet disposal point. There are also ladies and gents toilets with showers, sinks, shaving points and hairdryers. Separate vanity cubicles are also provided within the ladies toilet facilities.